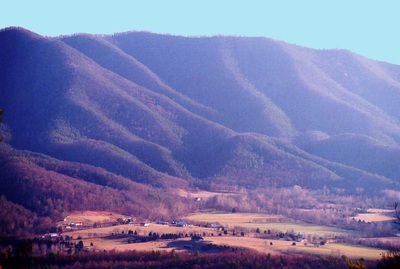 Traveling north on State Route 42 near Clifton Forge, it is nearly impossible to miss the pointed summit of Griffith Knob. This imposing monolith rises 1600 feet from the bank of the Cowpasture River to dominate the surrounding landscape. Griffith Knob is a true representation of the Rough Mountain Wilderness, its steep slopes are without a doubt, the most imposing aspect of the Wilderness. Located in Alleghany and Bath Counties, the 9,300 acre Rough Mountain Wilderness was established in 1988. 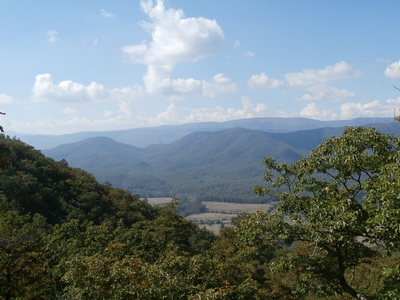 It is one of the largest Wilderness areas in Virginia surpassed only by Mountain Lake Wilderness and St. Marys Wildernesses. The dry slopes of Rough Mountain are dominated by gnarled Chestnut Oak and yellow pine. Shale barrens are common on the western slope below the crest of Griffith Knob. Rough Mountain Wilderness has the largest Shale Barren Special Biological Area in the whole George Washington National Forest, 3,000-acres. These dry, rock covered barrens host a unique assemblage of rare plant species and thick patches of lichens under a thin canopy of pine. A network of game trails crisscrosses the landscape. Another unusual aspect of the Rough Mountain Wilderness is its fossils. Along the Crane Trail and near Griffith Knob many of the rocks are encrusted with fossilized shells, formed at a time when the region was covered by water. Standing on the summit of Griffith Knob looking out to toward Clifton Forge it is hard to comprehend but the fossils leave no room for doubt. Due to its steep terrain, the Rough Mountain Wilderness has no significant creeks or rivers within its bounds. Many ephemeral streams can be found on the lower slopes but most run dry in the months of high summer. One major issue with Rough Mountain has been access for the public. The area is almost completely surrounded by private property. The western terminus of the Crane trail is on private property. To access the eastern terminus it is necessary to cross C&O Railroad tracks. However, access is not impossible for the intrepid hiker. One can reach the northern end of the Rough Mountain Wilderness on Forest Road 462. A hike to Griffith Knob is over a twenty mile round trip and there is no water. However, this is a true Wilderness experience, and the view from the summit is worth the effort. 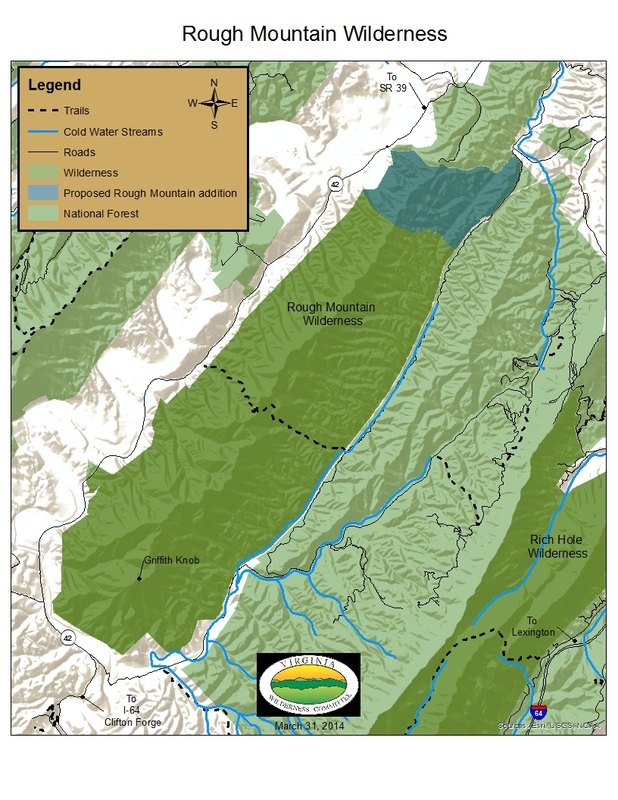 The management plan for the George Washington National Forest recommends a 1,000 acres addition to the Rough Mountain Wilderness, extending the northern boundary and including Big Hollow. Big Hollow is significant because it would be the only year round stream within the boundary of Rough Mountain Wilderness. Big Hollow is a narrow, steep-wall canyon with many small tributaries. The entire drainage would be protected, embracing a more varied ecosystem. The Rough Mountain/Rich Hole Wilderness complex lies within the Lower Cowpasture project, a large landscape scale plan involving many diverse stakeholders. These two areas and their respective additions are separated only by the C&O Railroad and a state maintained road. Due to their close proximity, they would create the largest Wilderness complex on national forest land in Virginia, encompassing over 21,000 acres. To find out more about the Lower Cowpasture project and the Rough Mountain/Rich Hole Wilderness additions, click here.